10.24.09 Live chess, or human chess as it is sometimes called, is chess played with real people standing in for the pieces. 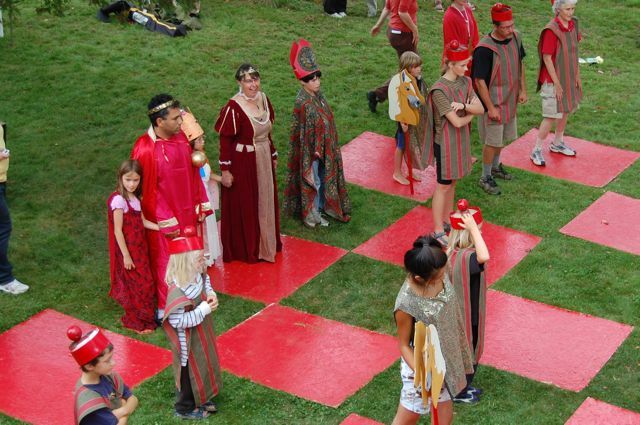 Recently there have been two live chess matches in Maine, one in Belfast at the Belfast Cohousing & Ecovillage and one in Fort Fairfield at the Maine Potato Blossom Festival. Check out these delightful images. Also, more recent photos can be found on the Potato Blossom Festival's facebook page. As this is a general public presentation, we play this Human Chess game for all the laughs. We show that chess is vibrant and full of life and laughs that can (and does) appeal to the populace. Sorry Roger, I prefer this approach.